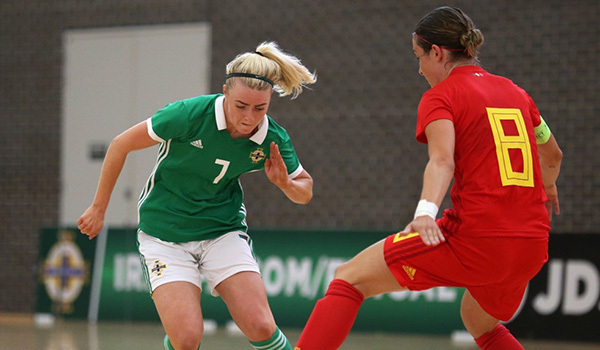 The Northern Ireland senior women’s futsal squad are gearing up for two games in Gibraltar this weekend. The matches against Gibraltar are due to be staged at the Tercentenary Centre on Saturday (6 April) and Sunday (7 April). Included in the squad for the first time is Mairead McCann, who earned her place after taking part in open trials back in October. Also new to the panel are four players who have previously been in training squads - Courtney Adamson, Siobhan Bell, Hannah Firth and Hollie Johnston. The Northern Ireland women’s futsal team only played their first game a year ago – and competed in their first international tournament back in August when they took on Netherlands, Belgium and Sweden in a preliminary qualifying round for the inaugural UEFA Women’s Futsal Euros. Head coach Keith Gibson said: “The team are delighted to be playing these games against Gibraltar as the next step in the development of this squad and this sport in Northern Ireland. There are no qualifiers scheduled for the senior women’s futsal team this year so the boss is aiming to arrange a series of friendlies to keep the squad ticking over. He pointed out: “This will be a stern test for the squad against a team who have grown up playing futsal. I’m sure the players will rise to this challenge and I know they will learn a lot from this experience.